The CENTER-TBI project has a strong emphasis on evidence synthesis and translation, with a view to sharing study results and management recommendations for TBI with professionals, policy makers and consumers. To support these aims, CENTER-TBI researchers are piloting the concept of Living Systematic Reviews. Living Systematic Reviews, as high quality up to date online summaries of health care research that are updated as new research becomes available, allow accurate and up to date answers to health care questions (Elliott et al 2014). To date, the concept is largely untested. 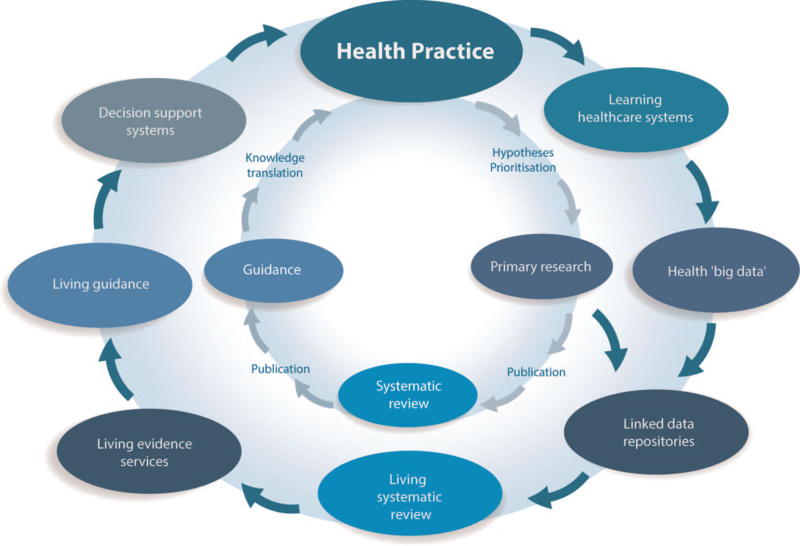 Living systematic reviews can contribute to an emerging new health knowledge ecosystem that is characterised by efficient, living components, together with traditional primary research. Future stages of the CENTER-TBI project will be at the forefront of these efforts, as they explore the ways in which living systematic reviews can contribute to living evidence services and guidelines, and clinical decision support tools. The figure below (reproduced from Elliott et al 2014, with permission) compares components of the emerging health knowledge ecosystem (outer circle), with the current health knowledge ecosystem (inner circle). Please check the publications list. M Cnossen, A Scholten, H Lingsma, A Synnot, E Steyerberg, E Tavender, D Gantner, F Lecky, S Polinder . 2014. Adherence to guidelines in traumatic brain injury. PROSPERO International prospective register of systematic reviews. C McFadyen. 2014. Genetic influences on outcomes from traumatic brain injury: a systematic review and meta-analysis. PROSPERO International prospective register of systematic reviews. A Brazinova, V Buckova, L Holkovic, M Majdan, W Peeters, M Psota, V Rehorcikova, M Taylor. 2014. Epidemiology of Traumatic Brain Injury (TBI) in Europe. PROSPERO International prospective register of systematic reviews. S Mondello, E Czeiter, A Sorinola, Z Vámos, Ka Amrein, A Buki. Prognostic accuracy of admission measurement of brain damage protein biomarkers in blood for outcome prediction in adults with traumatic brain injury: a living systematic review and meta-analysis. PROSPERO International prospective register of systematic reviews.